It's almost old news now but really enjoyed watching the Giro d'Italia, the annual three week bike race which tours Italy. 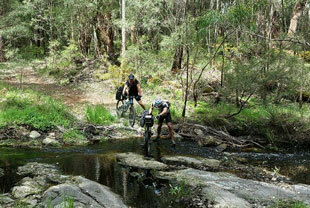 Amazing scenery, great riding, and tight competition, what more could you want? 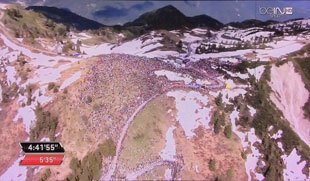 The climb over the Stelvio in snow was pretty incredible, but the final climb up the Zoncolan sticks in my memory, with thousands of people spread over the hillside to watch. Congratulations to Nairo Quintana, who outclimbed his Columbian countryman Rigoberto Uran to win. Italian surprise Fabio Aru was a strong third, but I have my eye on Wilco Kelderman, the Dutch kid who finished seventh. From CNN: Seven incredible bike routes. Added to the list :) My favorite so far is Munda Biddi trail in Western Australia... 596 miles off-road through forested wilderness. Wow. Did you see this? GE integrates iBeacons into Walmart lighting fixtures. You WILL be tracked. 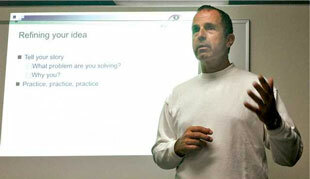 I posted about this on my other blog (eyesFindings), a week ago I was invited to give a talk about Starting up a startup to a group of entrepreneurs in the Santa Clarita Valley. Really fun. I love the sense that people have that they too can start a business and they too can be successful. It's the American way... now we have to get our government out of the way! I read that 3% of all startups succeed, but 75% of all startup entrepreneurs think they will succeed. 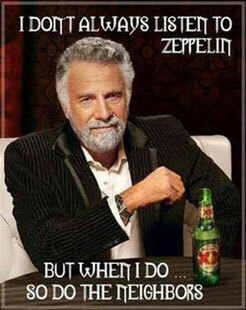 Count me in that group! 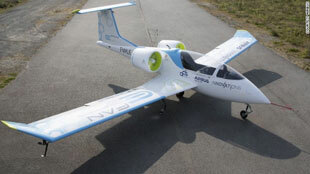 Excellent: Airbus electric plane takes to skies. It's little and it can't go very far, but it's a start... it just seems inevitable now that everything will eventually be powered by electricity, relegating fossil fuels to the dustbin of history. And the electricity will come from nuclear power. 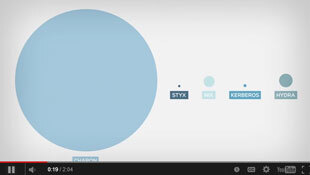 Are you a Cosmos watcher? 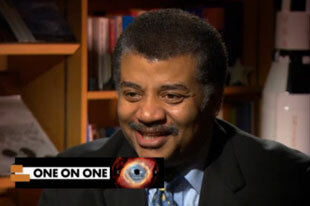 I am, despite not being a TV watcher; I like Neil deGrasse Tyson, and I like the idea that there's a show on TV which likes science. Here are the five biggest mysteries, according to Tyson: 1) Dark Energy, 2) Dark Matter, 3) What happened before the Big Bang, 4) How did we get from organic molecules to replicating life, 5) Are we alone? A pretty good list. I would add: "what happens to socks in the dryer?" Speaking of Tyson: the difference between weather and climate change. This is important to understand whether you think human activity is primarily responsible or not. 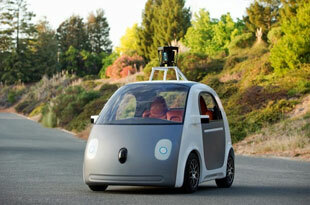 Tech news: Google unveil their self-driving car. It's so cute! And ... it doesn't even have a steering wheel. Like the Airbus plane, it's the future, although a little ways off. Of course there's no question it will be an electric vehicle, right? 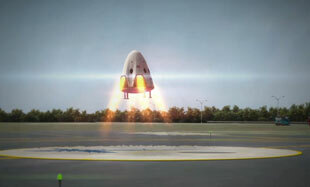 Telsa's (and SpaceX's) Elon Musk: It wouldn't be hard to build a flying car. Well then, do it! By the way, last year while in Tuscany I visited the Leonardo museum, in the town of Vinci. Very interesting. Full of little mechanical models illustrating some of his designs, many of which had to do with irrigation systems and techniques for building. 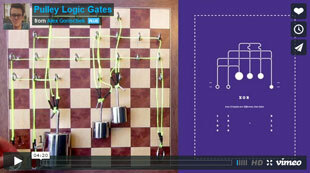 He would have loved pulley logic gates. 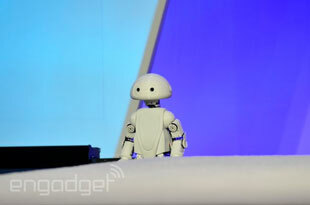 Intel will let you build your own 3D-printed robot, later this year. "Jimmy is a 3D-printed robot capable of walking, talking, moving his arms, dancing and even tweeting." Wonder if you can ask him to make copies of himself? Is this a great time to be alive, or what? 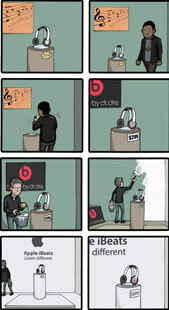 When I'm wrong, I say so: Apple acquires Beats Electronics for $3B. So be it. I guess they bought the combination of current revenue and brand and synergy, with the future of the music subscription service. And they bought Jimme Iovine, for a better connection between Silicon Valley (tech) and Hollywood (entertainment). A big deal. I'll have more to say about Apple's WWDC, Swift, IOS8, etc. in another post... it is clear they are slowly opening up IOS for more third-party development, perhaps in response to Android, or perhaps just because they're evolving. And it is clear that IOS and OSX will be more similar. Yesterday was a big day in sport: The Netherlands soundly defeated Spain 5-1 in their World Cup rematch of the final four years ago (go Oranje!). That header by Robert Van Persie was amazing, and those goals by Arjan Robben were incredible. Onward! ... and the LA Kings won the Stanley Cup over the NY Rangers. Yay. 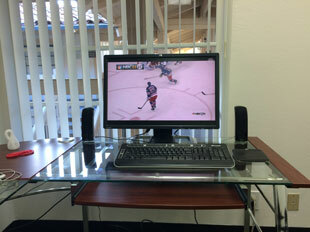 This is my hockey watching (slash programming, slash blogging) station in my new office.